Ran across this in my travels today. 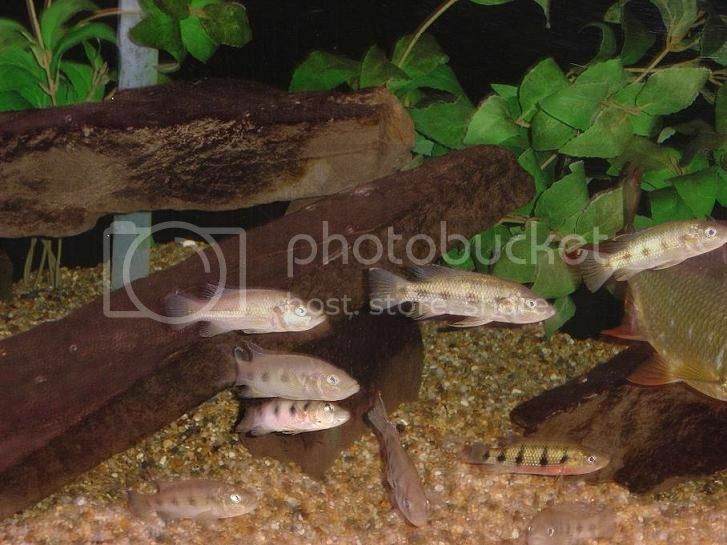 Labelled as H. elongatus although it looks like either fasciatus or frempongi. Given I've not seen H. fasciatus in a decade and H. frempongi have fallen off the face of the earth since Jeff Rapps stopped breeding them....I was very surprised to see these today. The black spots are 'clean' which tells me its frempongi, however the lack of red and it being in dotted lines make it look like fasciatus. Any help would be appreciated. The distinct lateral spots are common to all three species when young. 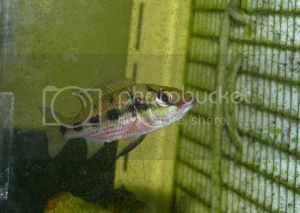 The rows of red dots on the lower flanks are more like elongatus, especially on a young fish. The head shape does look a bit more like frempongi. As I recall, elongatus has spangling on the flanks, even when fairly young, while this fish is not showing that. I would say frempongi rather than fasciatus. I've got a few feelers out there to 'people in the know' to see what they think. I don't believe it to be frempongi after looking at the ones I used to have in photos. the head/mouth was just different. I've only seen 6"+ fasciatus...the fish in the photo is about 3"+ and they looked pretty similar-that is what I thought they were. 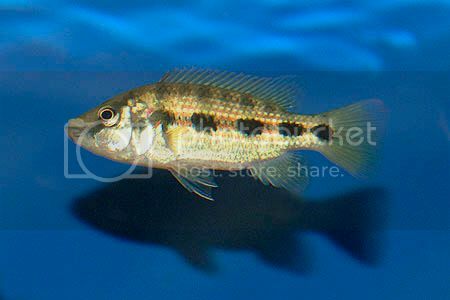 The elongatus that we know from Nigeria, does have the red dots but the ones I've seen are never in the belly, only between the black spots coupled with the green spangling that you mentioned. Here are a couple photos of the frempongi I had about the same size. Very upturned mouth. Got them in 2003/4 from Toyin and then shipped them to Jeff Rapps when I moved to TX from FL. Paul Loiselle got back to me this morning and told me that he believes this is the 'real' Hemichromis elongatus. The one from Nigeria, according to Anton Lamboj (per Paul) is an undescribed Hemichromis. The original description of H. elongatus was a fish that was caught in Gabon or the Congo and he believes it is this fish. I've sent him a note back requesting more info. After digging around, I believe that he is correct. From what I've pulled up on the internet, there are a couple reports of Hemichromis cf. 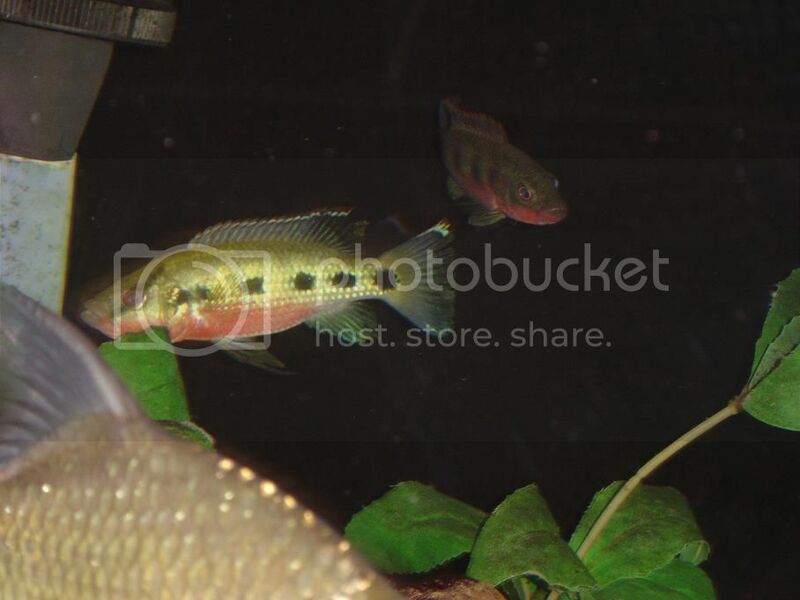 elongatus 'super red' from a few years ago. I would agree. I need to set up another tank if I get them. Still thinking about it. I recall that Toyin had Gabonese elongatus on his list a while back which would add further credence to Paul's assessment, not that any was needed.